The new web browser from Microsoft which is set to replace the slow, bloated, lack in web standards support and resource-hungry Internet Explorer, Project Spartan, has been released for sneak preview on March 30, 2015. Project Spartan was making its appearance in the build 10049 of Windows 10, which had been pushed to Windows 10 Insiders who are on the “Fast” ring. Project Spartan web browser is an effort by Microsoft to regain its crown in the web browsers war, where the market share of IE is steadily declining. As such, Spartan contains improvements and features that fix what’s wrong with IE. 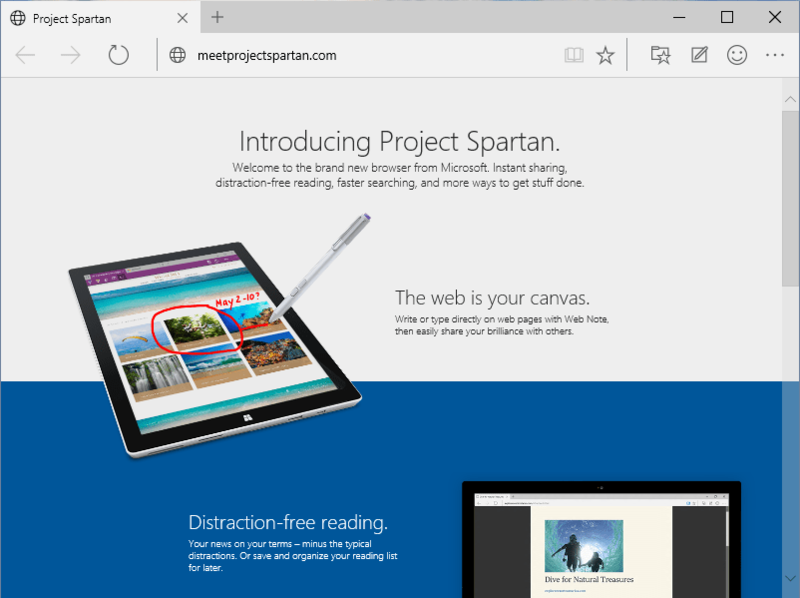 The features and improvements of Spartan web browser including lightweight browsing with low memory footprint; minimalist user interface (UI); plugins support; new rendering engine dubbed “Edge”, a streamlined version of Microsoft’s 18-year-old Trident engine which will continue to power IE11, to speed up performance; digital inking support for writing, typing or annotating web pages; ability to share annotations via email, through social networks, or by clipping them directly to OneNote; new Reading View mode which removes distractions; Reading List to save web pages for later reading; integration of Cortana which serves as a virtual assistant while browsing to provide contextual information; and etc. Most of the features of Project Spartan is ready to be used, thought Cortana is available only is US English version of Windows 10 Technical Preview. In addition, more features will be added to Project Spartan before the final RTM of Windows 10. For example, Download Manager and ability to open a web page in IE instead was added since build 10051. Windows 10 will ship with both Project Spartan which may be in another name and IE11. But in future, Project Spartan will be the focus of Microsoft, with IE11 primarily included for backward-compatible purpose primarily for enterprises. IT administrators can set IE11 as the default browser within their organizations via group policy. Microsoft revealed that Project Spartan will be regularly updated along with the rest of Windows 10. In fact, the new browser will be updated through Windows Store, making regular feature updates possible. To use and experience Project Spartan, download and upgrade to Windows 10 build 10049 via Windows Update for Windows Insider who is currently running earlier builds of Windows 10 Technical Preview. If you haven’t installed Windows 10, download the official Windows 10 ISO March Update, then check for updates in Windows Updates. Currently Spartan is only available for desktop version of Windows 10. Once installed, Project Spartan appears in the list of apps in Start menu, and is also pinned to Taskbar which is identifiable as a little blue globe icon . Project Spartan shares the bookmarks with IE, so no import export or sync required.